Recently I purchased a kite that grab my attention and re-ignited the desire to share with others the virtues of a particular kite. 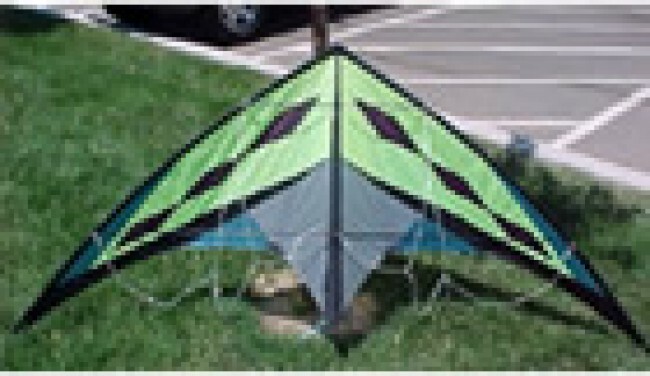 When I started writing reviews for Kitelife.com I began with one rule- I had to like the kite. I’m not the “Consumer Report of Kiting.” I’m just sharing what I have found to be enjoyable with others. There are plenty of forums and places for others to say what they don’t like about a kite. Just because I don’t like a kite doesn’t mean someone else will not also. Over the few years that I’ve written reviews there have been several kites that I did not like. Without a consistent set of controlled evaluation standards, I’ll leave all the unpleasant reviews unwritten. I soon began to see that another principal should be used in reviewing a kite. The only real standard a kite can be judged by is does it meet the designer’s intentions? My favorite reviews were those that I got to interact with the designer, to see the kite through their eyes. When I contacted Jon Treneepohl about the ADX he was more than willing to share about what he had in mind when he and Wayne Brunjes created the ADX. I found his comments so interesting that I included them in their entirety at the end of this article. His comments are far more important than anything I could say about this kite. When I bought the ADX it was for one purpose. I wanted a bigger trick kite. I was tired of the 6+’ trick kites that dominate the market (or at least my kite bag). I learned on the 7+’ kites and longed to have a new one. I never expected that this would become my go to kite for ’03! It’s fluid, and agile. It’s quick but precise. It tracks on rails, but it’s the unabridged dictionary on tricks! At this point I realized how impressive Jon Treneepohl is at designing kites. Jon was there near the beginning of the modern stunt kite movement, yet there is nothing old school about his designs. To design a great kite is quite an accomplishment. To design several great kites is even more amazing. Usually though each new kite has traces of it’s heritage in it. The ADX, in my opinion is like nothing else that I’ve seen from Jon! It has a unique intriguing sail design. It has a new bridle design that is simple in function, yet yields extraordinary results. Where the kite does show it’s Skyburner roots is in quality. Construction is superb, that’s why Jon can offer the support that he does. Jon, What was your goal in designing the ADX?? To be able to compete as an American Sport Kite manufacturer I had to continue to go after the goals of producing more of an art form or very beautiful kite. We are also keeping up with the latest aspects of performance in being able to do the latest tricks and still have a solid all around sport kite that most anyone can enjoy. We are also after the latest in the technical and Quality side of things. What are you really pleased about regarding the kite? It gives you the ability to go to a new level in sport kite flying, every time I go out with this kite I am doing things that I could not do with other sport kites. The one thing is the kite’s ability to be on it’s back and recover to whatever you want to happen next. The new thing seems to be combination trick flying, one to another and on to another, and still have precision and all the other good stuff that’s fun. Where did you come up with the inspiration for the sail design? Originally we, Wayne Brunjes and I designed the addiction for Premier Kites. We wanted to design a beginner trick kite that got out of trouble easy so you don’t get frustrated walking to your kite all the time. The kite also had to take a lot of punishment and not break. It was not designed for the first time flyer. But I have started people out on this kite and they have had fun. After designing the kite we would leave it out on the field for people to fly and they would fly it for awhile and then after a while we would see them come back and fly in some more I would go up and ask what they thought and was told by more than one that they found the kite habit forming, more than one person said it was addicting. Because you could do any trick in the book, stay out of trouble and keep flying it earned its name. I was at the AKA nationals in Ocean City and there was this really good flyer name was Ron and he starts test flying the Addiction and really liked the kite. He liked that it could do anything he wanted it to easily. He asked if I was intending to make a larger version of the kite. We had already planned to do this. Thus the ADX (addiction extreme) This kite also has a unique bridle system, You can either fly the kite on the black to black settings which is a standard 3 point bridle which is better for trick flying on short lines. In seconds you can switch to a turbo bridle setting (red knots to red knots) and be flying with a different feel which I think is better for long line flying and more precision. It is nice to have an option on which way you like to fly. It is a very simple system. Tell me a little about Wayne Brunjes. Wayne is originally from Long Island , New York. He went to Eastern Michigan University. He went back to New York after graduation and then came back to Michigan to live. He started flying kites in New York and looked us up when he returned to Michigan and has been with us since. Wayne has been a part of the Kite Shop for the last 12 years. His real life work is graphic arts. He just recently did the cd which is included in our catalog. He does do all our advertising in all its forms. How long have you guys worked together on designing kites? We have been designing kites together for over 10 years. Most all of the kites that we have designed have been a co-operative effort. Wayne’s expertise is Sail layout and patterns. It’s hard to pinpoint who exactly does what because we work together on it all. It varies on each individual kite design. I usually do all the finish sewing of the prototypes, the framing and the bridles. On the ADX, what would you say are the advantages of NOT having winglets? Are there limitations that they would add to the kite? The biggest reason we always used winglets (battens on the outside/inside of the kite) was to cut back on the trailing edge noise and thus not have to use a leach line. This always made it easier in manufacturing the sails and building the kites. The limitations are that people lose them all the time. We did find that when we made the addiction that the first one it had four stand offs ,didn’t have a leach line and and it made some noise but it flew so good with four stand offs that we just added the leach line to reduce the noise. Any other comments you would like to make about the kite? This is the first four stand off kite with a leach line that we have designed. It just worked this way. We wanted to try something new for us. This is the first appliquéd kite we’ve done. We’re always searching for the ultimate flying machine. Usually you have to give up something to gain something. The goal is to gain the most and give up the least. We feel this kite is the closest we’ve ever come to that. We have great pride in our kites and we always strive to have the best quality and technology possible in a high performance sport kite made in America. One thing about Sky Burner Kites, you may pay a little more for the kite but we take care of it forever. We stand by our products 100%. We have been producing Sky Burner Kites for 14 years and we always strive to do better and make the best possible sport on the market. – Jon. The ADX and the Addiction are both great kites. I highly recommend both. These two have found a permanent home in my kite bag. In fact thanks to them, there is a lot more room in my kite bag. This entry was posted in 2003, Dual Line, General Topics, Issue 32 (Sep/Oct), KL Archive and tagged adx, review, skyburner, sport kite.